When I became pregnant with Lentil I gave up coffee and green tea and anything else with caffeine in it – just like most first time mothers-to-be worried that even a drop could be damaging! I realised I could survive quite well without coffee. I actually don’t really like coffee, but had become a daily drinker: fetching a latte was an excuse to escape the relentless stressy office environment for five minutes once or twice a day. I also hopped the caffeine would actually keep me awake no matter how little sleep I got! I did, however, miss my green tea and now that our youngest is nearly one (eek!) I find myself enjoying a few cups a week again. I have never cooked with it before though and really wanted to experiment. 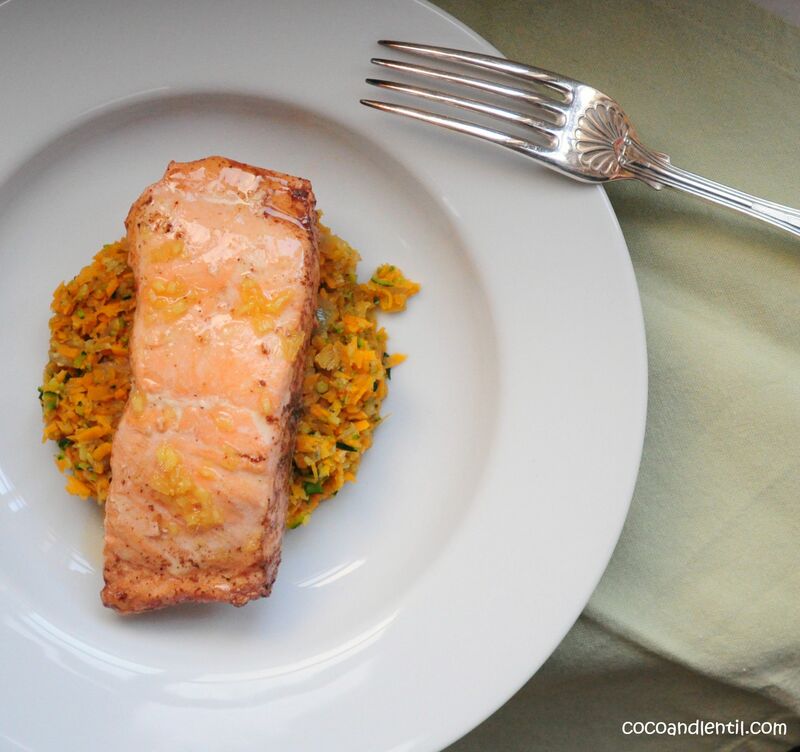 I thought it would work well with something light and summery and dressed or glazed salmon sprung to mind: Coco and Lentil love salmon. Although I must confess it is lashing rain as I write and not very summery at all! The sun was splitting the stones as we ate this last weekend though – scouts honour! This dish is so quick and easy to make and surprisingly tasty. I served with some vegetable rice (another chance to use my spiralizer, which is still my new favourite kitchen gadget!) 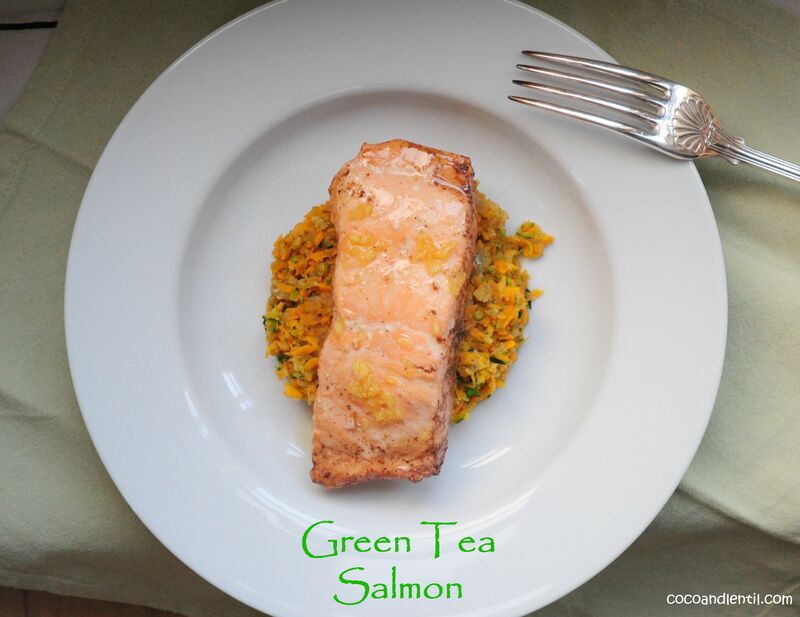 but you can also serve the salmon with noodles or rice if you prefer. Add the tea leaves to 100ml boiled water and steep for 8 minutes. Strain into a large saucepan (into which the salmon fillets will fit) and simmer for 15 minutes. Using a spiraliser or a mandolin, finely slice the carrot and courgette. Then pulse in a food processor until it looks like rice. Heat olive oil in a saute pan and add the shallots. Cook for 2 minutes until soft, add the sweet potato and courgette and cook for another minute. Add the stock and cook for 5-7 minutes on medium heat until the sweet potato is cooked. Add more stock if the vegetables begin to stick to the bottom of the pan. Meanwhile add the salmon to the tea and water and poach for 7 minutes. To make the dressing add all the ingredients to a saute-pan and cook for 2-3 minutes on medium heat. 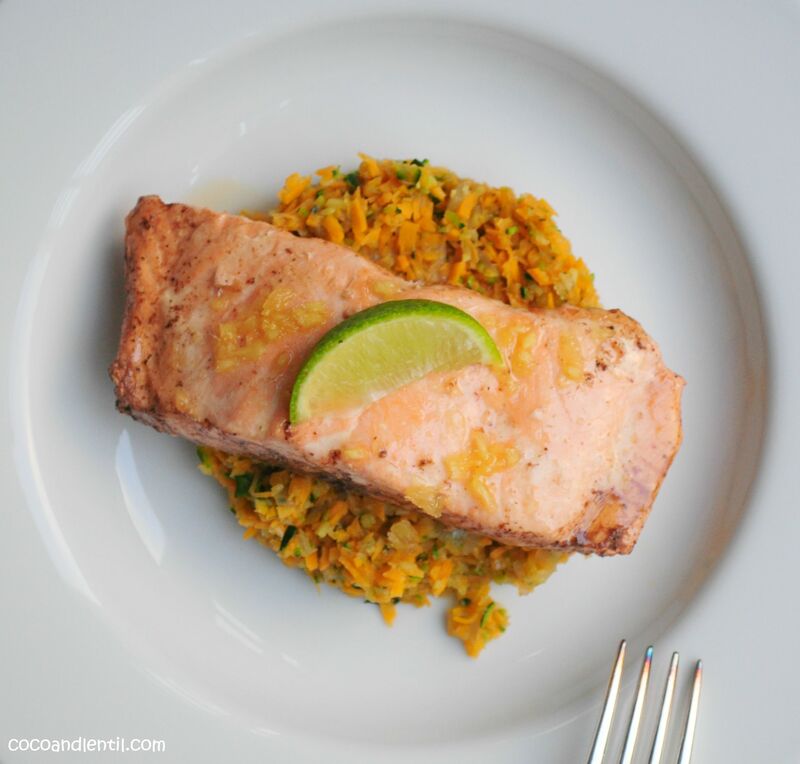 To serve divide the “rice” among your bowls / plates, place the salmon fillets on top and drizzle over the dressing.